A $65,000 grant to create a nanomaterial that can perform the work of a water treatment plant has been given to Heather Shipley, chair of the Department of Civil and Environmental Engineering and Burzik Professor in Engineering Design at The University of Texas at San Antonio (UTSA), and Kelly Nash, associate professor of physics by the National Science Foundation. The main area of focus for Shipley is water, and in earlier research projects she has experimented with commercially available nanomaterials. As Nash's expertise is nanomaterials, the two colleagues chose to strike a partnership to create a composite of a number of nanomaterials so that a single material could perform the task of many. We're working to create a nanocomposite material to treat pollutants in water. This could be used for in-home water treatment, or it could be used in developing countries where the infrastructure for water treatment plants might not exist. The material, which the researchers along with a team of UTSA graduate students are creating, is totally new. It is stimulated by sunlight, causing heavy metal and organic pollutants to dissolve via light reaction. "It's doing the job of a water treatment plant, but it also goes a step further," Nash said. "In a plant, there are many processes to catch these pollutants but when you get down into the levels of microbial and toxic metal ions you need a nanomaterial to filter them." Shipley observed that water sources globally are polluted by industrial processes and in several other ways, which makes the water unsafe to use. Instead of focusing on one specific pollutant, she and Nash aimed to develop a material that could address a most of them. It made sense to create an end-user type of solution instead of create a new type of water treatment plant for a new city. 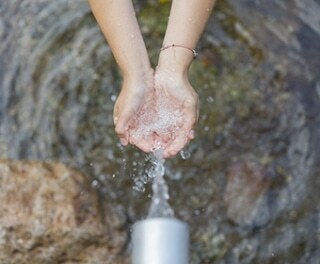 That way it's accessible and much more feasible, especially in developing areas where there's minimal water treatment. Presently, Shipley and Nash are developing the new material for a year and are so far pleased with its performance, but they have to face a new challenge: making the material reusable. "Once it's activated by light, it does what it's been designed to do, but then it's done," Nash said. "We don't want to make more waste, so now we're working on making the material regenerate so it can be used again and again."